Matthew 4: v1-11, Mark 1: v11-12 and Luke 4: v1-13. Satan tempted Christ in three areas. 3) The temptation to win power and wealth by Christ giving homage to Satan. Christ's temptation took place in the desert region of the lower Jordan valley. 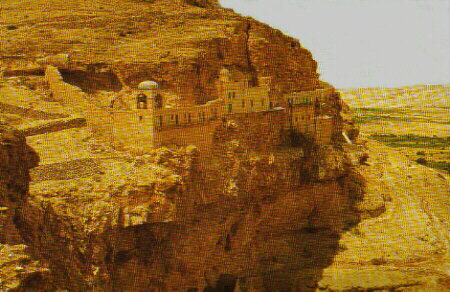 The exact location of the temptation is not known, but the 1st and 3rd temptations may have occurred at the present location of the monastery on Jebel Quarantel. Also known as the "Mountain of the 40."